Pocket. Paperback. POOR. Noticeably used book. Heavy wear to cover. Pages contain marginal notes, underlining, and or highlighting. Possible ex library copy, with all the markings/stickers of that library. Accessories such as CD, codes, toys, and dust jackets may not be included. Pocket Books, 1988. Paperback. Acceptable. Disclaimer:A readable copy. All pages are intact, and the cover is intact. Pages can include considerable notes-in pen or highlighter-but the notes cannot obscure the text. At ThriftBooks, our motto is: Read More, Spend Less.Dust jacket quality is not guaranteed. Pocket Books. Good. 1988. Paperback; 1st Printing Thus. 0671612700 . 7 oz. ; 255 pages; PB some reading/shelf wear aged good clean/tight condition 1st Pocket Books PB Printing. In the depths of an abandoned steam bath, strangely beautiful women seduce two businessmen into a ritual of macabre sexuality; in a Greek asylum, wise men race frogs to decide the fate of the world; a petty convict's cellmate reveals to him the gruesome birth of evil; a young woman's slum research leads her into the hookhanded grip of the Candyman, a vicious supernatural killer. .
New York, NY, U.S.A.: POCKET BOOKS, 1988. Book. Good. PAPERBACK. THIRD PRINT BEFORE PUBLICATION. BLACK SPINE. POCKETBOOKS. 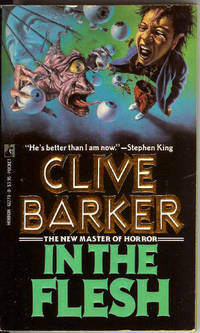 1988, 3RD PRINT. 255 PPS. 1 CREASE AT BOTTOM CORNER. TEXT IS CLEAN AND SECURE. PAPERBACK BOOK. Pocket. As New. 1988. Paperback. 0671612700 . 7 oz. ; 255 pages; Unread/Unmarked PB light shelf wear. 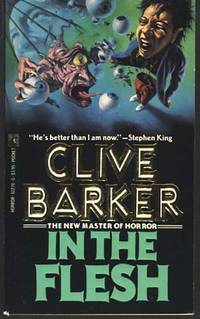 Terrifying and forbidding, subversive and insightful, Clive Barker's groundbreaking stories revolutionized the worlds of horrific and fantastical fiction and established Barker's dominance over the otherworldly and the all-too-real. 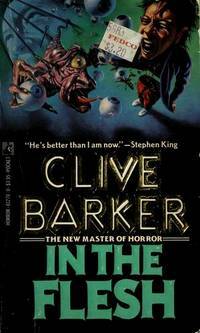 Here, as two businessmen encounter beautiful and seductive women and an earnest young woman researches a city slum, Barker maps the boundless vistas of the unfettered imagination -- only to uncover a profound sense of terror and overwhelming dread. .
Pocket. Paperback. 0671612700 . Very Good. 1988-01-02. New York: Pocket Books. Paperback. 1988. 1st thus. 16mo 255pp . Fine with no DJ. Mass Market PB . New York: Pocket Books # 61270 1st Printing , 1988 ----------paperback. 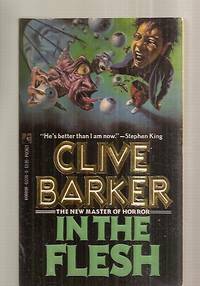 An as new, unread copy, protected and stored since purchase. . .. Mass Market Paperback. As New. Illus. by Jim Warren (front cover). Note: our prices on Biblio are the LOWEST of any of the sites on which we list our books. New York: Pocket Books, 1988. Paperback. Pocket Books 61270-0. First Pocket Books printing. A near fine copy. ; Small octavo; 255 pages. Pocket. Used - Good. Ships from the UK. Former Library book. Shows some signs of wear, and may have some markings on the inside. 100% Money Back Guarantee. Your purchase also supports literacy charities. New York: Pocket Books . Very Good. 1988. First Thus. Mass Market Paperback. 0671612700 . First printing thus. Collects 4 stories. 255 pages. VG+ copy [bumping/light wear to the spine head rear corner, cheap text paper starting to tan]. .